From Boston to Beijing in the week in pictures. 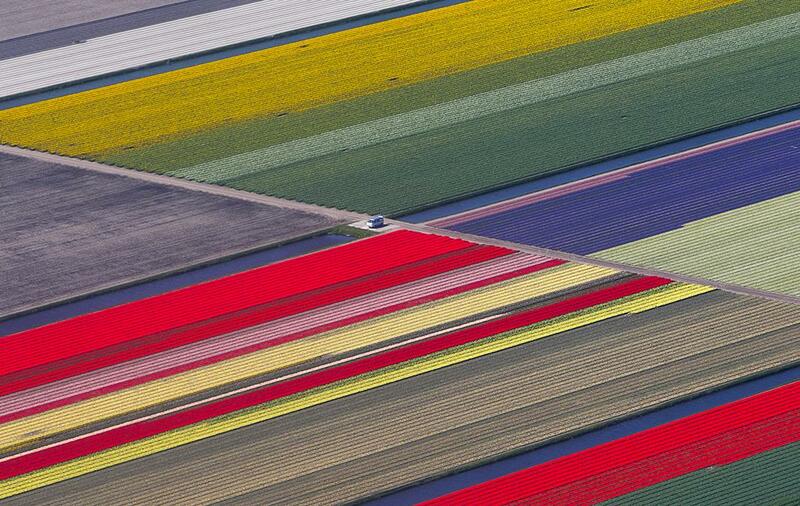 An aerial view of flower fields is seen near the Keukenhof park, also known as the Garden of Europe, in Lisse, Netherlands, on April 15, 2015. Keukenhof, which employs some 30 gardeners, is considered to be the world’s largest flower garden, displaying millions of flowers every year. 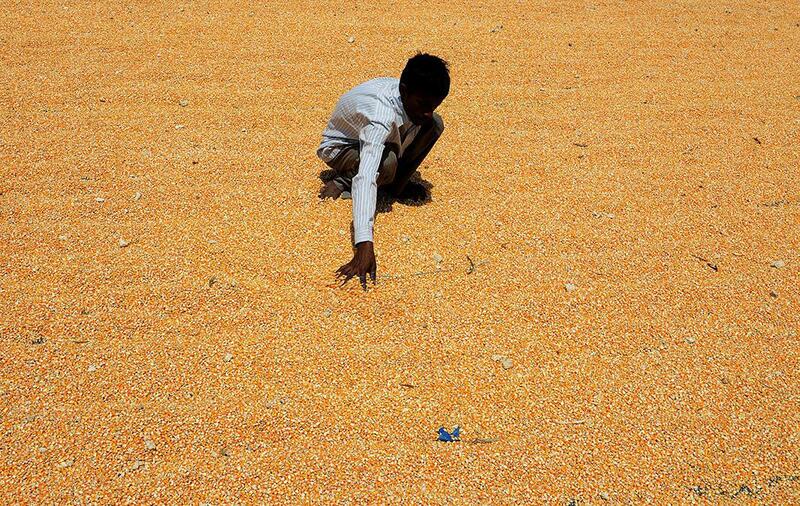 An Indian farmer dries maize following unseasonal overnight rains in Toopran Mandal in Medak District, near Hyderabad, India, on April 13, 2015. Three people were killed as heavy rains caused widespread damage to standing crops in several parts of the southern Indian state of Telangana. 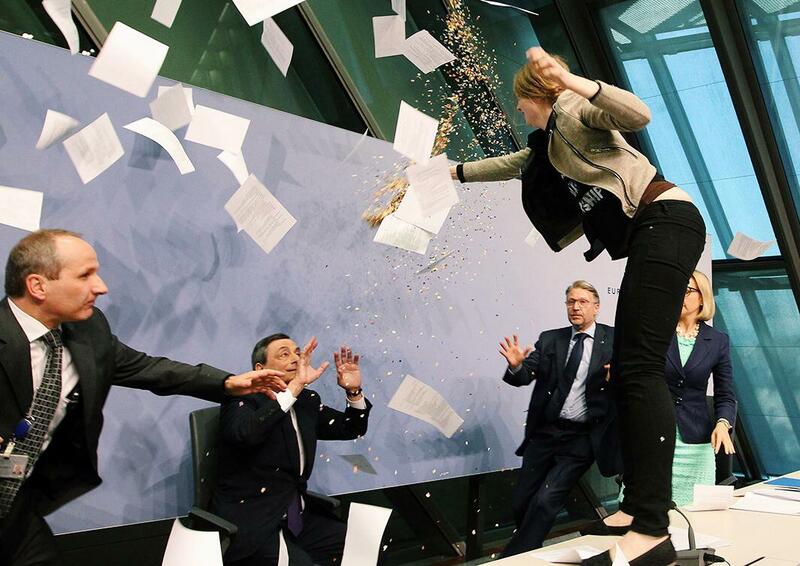 A woman jumps on a table and throws papers and confetti as she disrupts a press conference by European Central Bank President Mario Draghi (center) following a meeting of the Governing Council in Frankfurt, Germany, on April 15, 2015. The woman who charged at Draghi calling for an “end to the ECB dictatorship” was quickly escorted out of the premises by security officers before the news conference resumed. 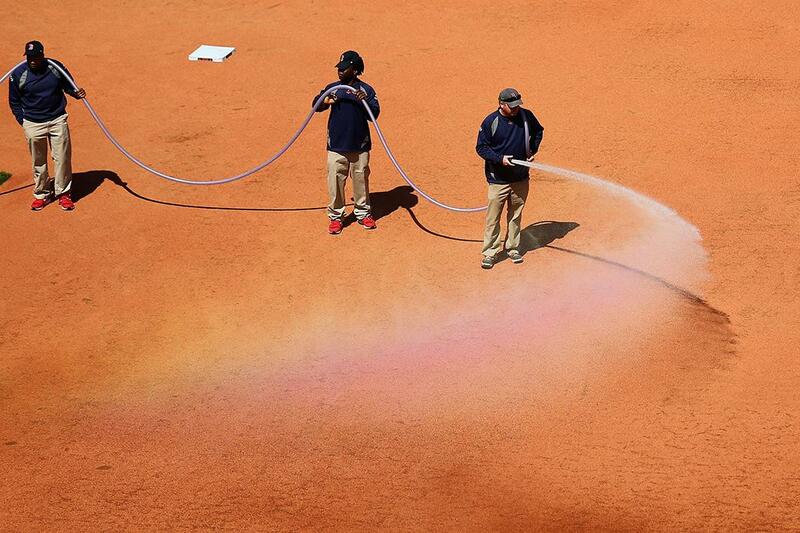 The grounds crew prepares the infield before a game between the Boston Red Sox and the Washington Nationals at Fenway Park on April 13, 2015, in Boston. 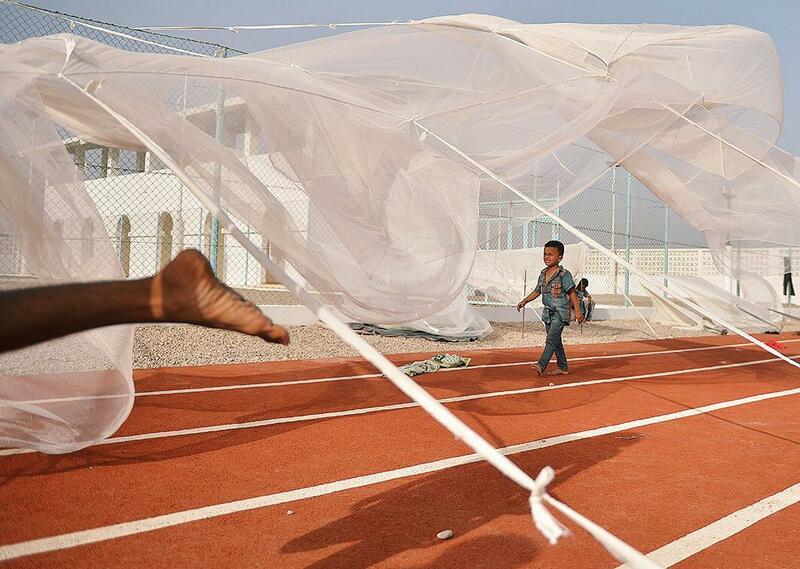 Yemeni refugees play on April 12, 2015, at a boarding facility run by the U.N. High Commissioner for Refugees in Obock, a small port in Djibouti on the northern shore of the Gulf of Tadjoura, where it opens out into the Gulf of Aden. The U.N. said at least 900 people had arrived in the Horn of Africa in the past 10 days, including 344 Yemenis who sought refuge in Djibouti even as fresh Saudi-led airstrikes pounded rebel positions across south Yemen on Monday. An Iraqi man kisses a body bag lying amidst others containing the remains of people believed to have been slain by ISIS jihadists lying on the ground at the Speicher camp in Tikrit, Iraq, on April 12, 2015. ISIS executed hundreds of mostly Shiite recruits last June in what is known as the Speicher massacre, named for the military base near which they were captured. 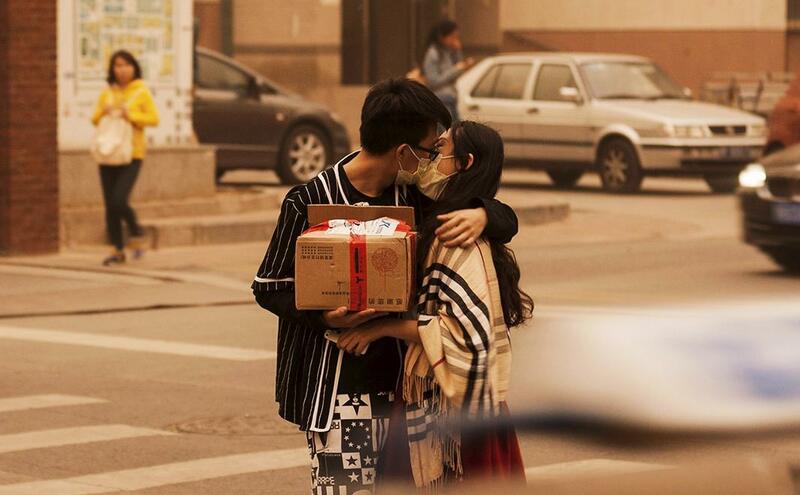 A couple wearing masks kiss along a street during a sandstorm in Beijing on April 15, 2015. 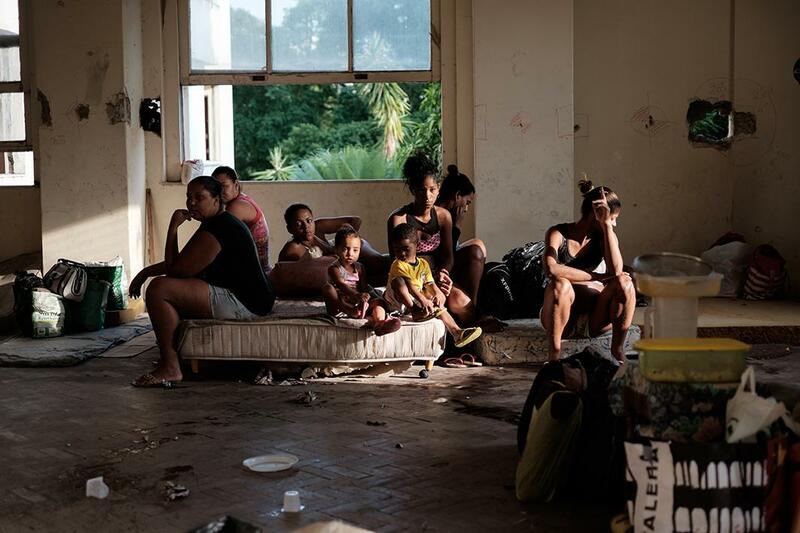 Squatters wait to move out from inside an occupied apartment building the day of their eviction in the Flamengo neighborhood of Rio de Janeiro on April 14, 2015. More than 100 squatters who had been evicted from the city’s port area last month invaded the building that was once owned by Brazilian businessman Eike Batista, once Brazil’s richest man, a week ago. 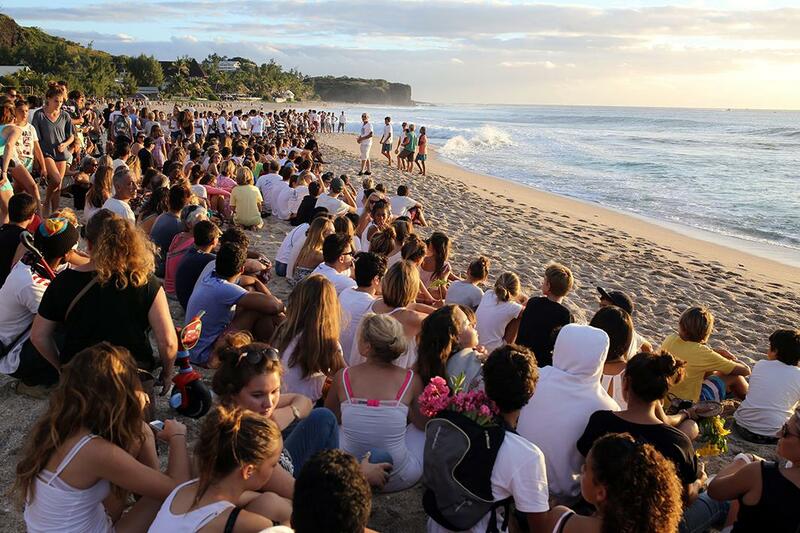 Several hundreds of people gathered on April 12, 2015, on the beach in Les Aigrettes on the western coast of the French Indian Ocean island of La Réunion to pay tribute to a 13-year-old boy who was attacked and killed by a shark Sunday. The shark tore off the boy’s limbs and part of his stomach as he was swimming in an off-limits section of the ocean off the west coast of the island. It was the 16th shark attack on the island since 2011 and the seventh loss of life. 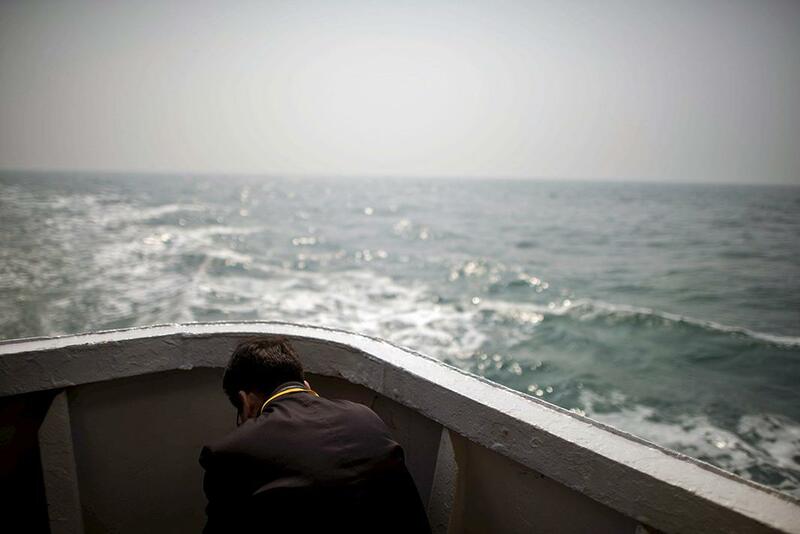 A relative of a victim of the Sewol ferry disaster sits on the deck of a boat during a visit to the site of the sunken ferry, off the coast of South Korea’s southern island of Jindo on April 15, 2015. 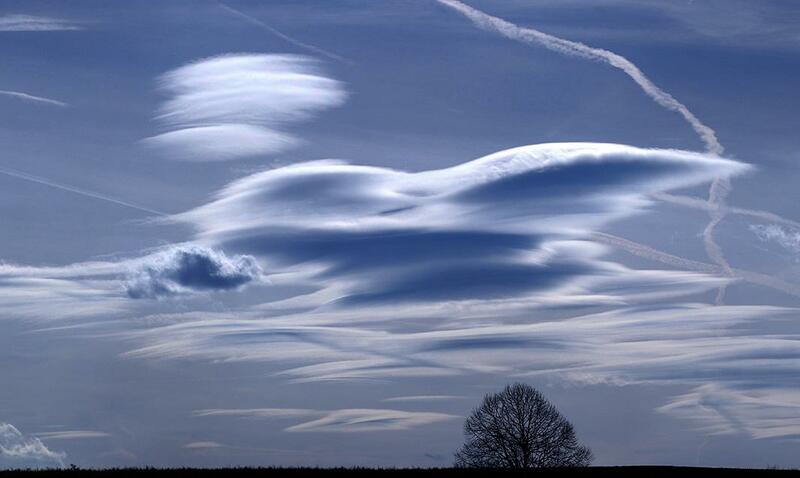 Clouds hover in the sky over Ebersbach in southern Germany, on April 14, 2015. *Correction, April 20, 2015: Due to a photo provider error, this post originally misstated that the Gajan festival fell on the last day of the Bengali calendar. 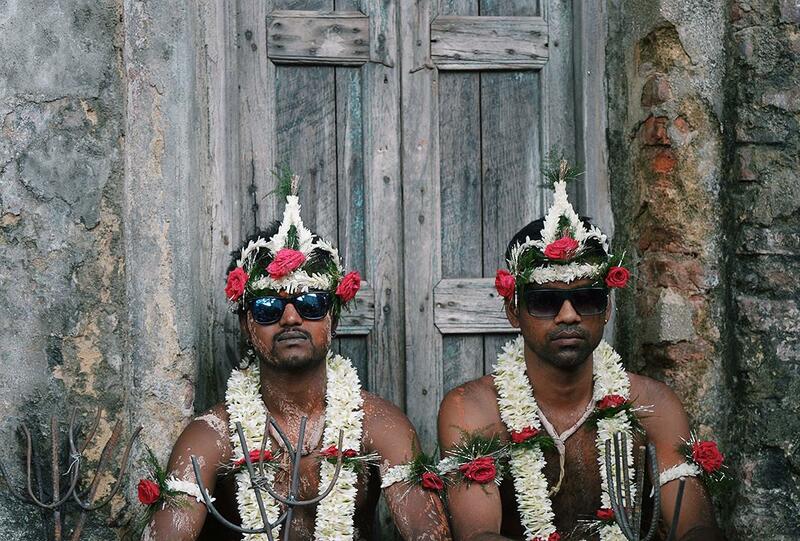 The festival lasts for a month and concludes on the final day of the Bengali calendar.